After the great Italian success of My Special Car Show in Rimini, Elettromedia saw an incredible success of visitors at “Car+Sound Show 2007” as well, the most important car electronics show in Europe, which took place in Sinsheim, Germany, from 19 to 22 April 2007. The Elettromedia booth, proving to be once again unquestionable leader in the show, attracted the car audio fans with three superlative demo cars: a Hyundai Coupé, an Opel Astra and a Fiat Grande Punto. This latest car, just like at the “My Special Car Show”, was the queen of the event: with an installation designed to produce sensational sound power, literally “invaded” the Hall 1 with its sound. Elettromedia presented the latest new products in Sinsheim: the new SPL Monster subwoofer line for the Hertz brand. The products, which the visitors of the Rimini show had already appreciated, were welcomed with great admiration by the international Car Audio specialists. The Elettromedia exhibition area offered an overwhelming animation to the visitors of the show: music and girls, among which there was also Miss E.M.M.A. (European Mobile Media Association), which were at the booth to celebrate the recent entry of the Hertz brand into the official E.M.M.A. network partners. 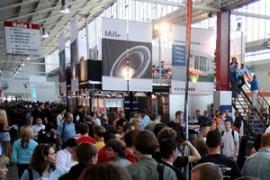 The company also arranged two booths in the areas devoted to sound competitions, the E.M.M.A. and the dbDrag area. Inside the first area an Hertz Mille demo car was displayed, the Chrysler Voyager, equipped with an audio installation made by the Elettromedia designers, thus showing the top level know-how and highly professional standards. At the same time inside the dbDrag area, a Seat Ibiza was playing, originating from the collaboration between the Italian magazine “Mega Tuning” and Elettromedia. Just like last year, the presence of Elettromedia on this important European stage ended with excellent results, proving that the company’s success is growing bigger and bigger!